Wow we are into our 21st year. Body & SOUL is back at Club Space Ibiza/New York to kick off 2017 and more events planned later in the year. 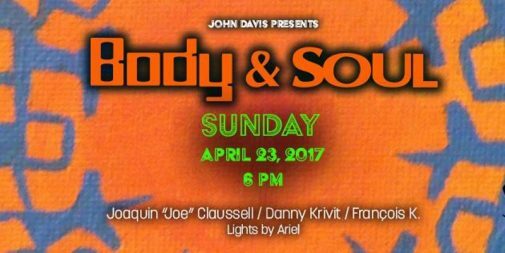 Join our musical Maestros Joaquin (Joe) Claussell, François-K and Danny Krivit and Ariel Figueroa on lights for another night of music dance and love. 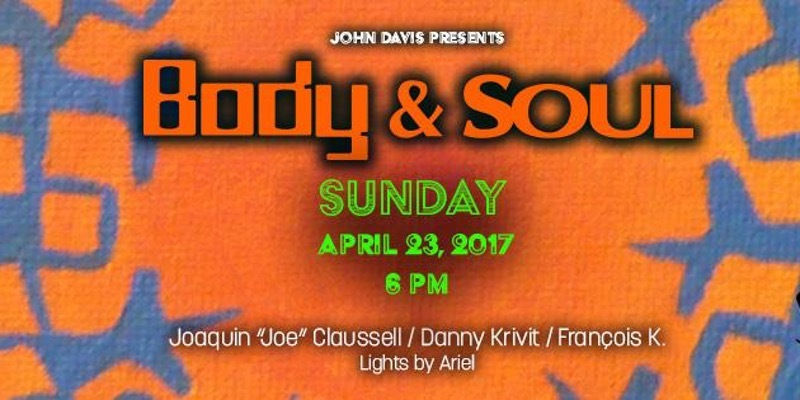 Body & SOUL started as a weekly party in New York City at Club Vinyl in 1996. Being considered by many as Church on Sundays the party was known for its unusual operating hours of 4pm till midnight. 20 years later and this party is still going strong with a blend of musical talents in the form of 3 DJ;s playing together as one. A musical journey of everything from House to Jazz and from rock to Techno. The blend is seemless and the vibe is second to none. Brought to you by 3 seasoned and well respected DJ’s François-K, Danny Krivit and Joaquin “Joe” Claussell. Body & SOUL is known across the globe and frequently tours in Japan, London, Italy and many other international locations.